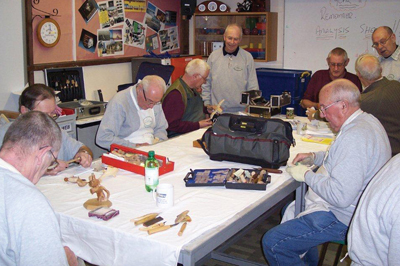 Oaklands Woodcarving Club originally started, like most, as an adult education course in 1990, but rising fees and the constraints of red tape forced our founding members to form their own club. 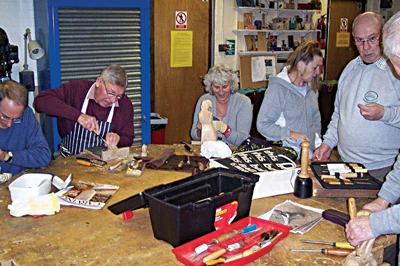 Today we have 40 members ranging in age from 40-80, each with their own carving interest and varying level of skill. We meet every Monday - from September to May - at Oasis Academy School in Lordhill, Southampton. In all the 22 years Oaklands has been running, there has not been a cross word between our members. The club is like a family, only better as you can't choose your relatives but you can choose your friends! We have a comprehensive range of tools for members' use, although many have their own gouges, chisels and knives. Our members also have an extensive reservoir of knowledge, which they happily pass on to the beginners. Each meeting we have a pin board next to the kettle upon which we advertise items for sale, give-aways and future events. On a sad note, however, we recently lost our very first honorary member, Jean Gordon, a lovely lady and brilliant carver whose work was an inspiration to all who knew her. She will be sadly missed. We have among our members gold prize winners of past Axminster Tool Shows, namely Graham Limburn and Fred Wilson. We can proudly boast that two of our members were awarded three gold awards three years running! We are very keen to encourage young blood into our club, but convincing teenagers that wood carving is not an 'ole duffers' pastime can be quite a challenge! Over the years we have managed to build a library of reference books, catalogues, patterns and general information relative to woodcarving which usually is a good source of inspiration. 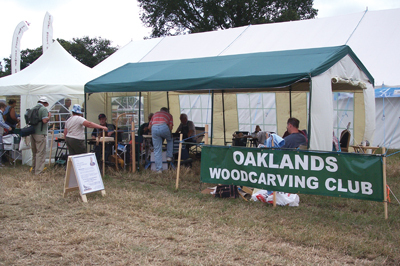 Each year the club members visit places of interest such as Yandles' open days and the Westonbirt Festival of Wood, which are both great days out for gathering information, advice, new tools and of course timber! 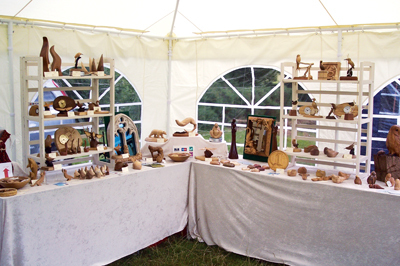 We also attend several craft shows where we exhibit our work and carving techniques. We always manage to pull in a good crowd and have a natter, normally resulting in additions to our membership waiting list. Of course, all that talking requires another cup of tea, but someone's got to drink it! Every term we try and have guest speakers. Past speakers have talked to us about ship figure head restoration, decoy duck making, gilding, soap carving, letter carving, pyrography, stick making and a falcon flying display. The flying display was a brilliant opportunity to study birds up close and personal, with photo opportunities for future reference. 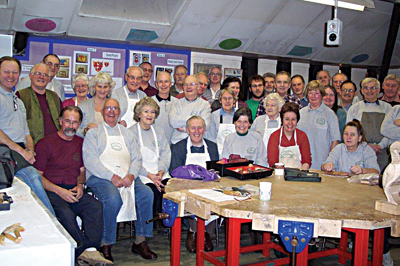 The club also had a Saturday workshop in 2011 with Peter Benson where we all carved a Tudor rose in relief under his watchful eye. Peter is a really nice guy with an easy manner and the event was such a success that it was repeated in August, 2012. We also had a fantastic evening listening to Ian Brennan and watching his film slides. Ian is a royally appointed woodcarver, with much of his work commissioned by Windsor Castle. Many of our demonstrators are only too keen to donate their fee to Naomi House which is a local children's hospice and the club's nominated charity. Keen to maintain competition we recently had a rematch indoor skittles evening against our close neighbours - The Waterside Carving Club. Unfortunately we lost the last match and took home the losers' trophy, but this time it was their turn to lose. The evening was very informal, good fun with a lot of friendly banter.